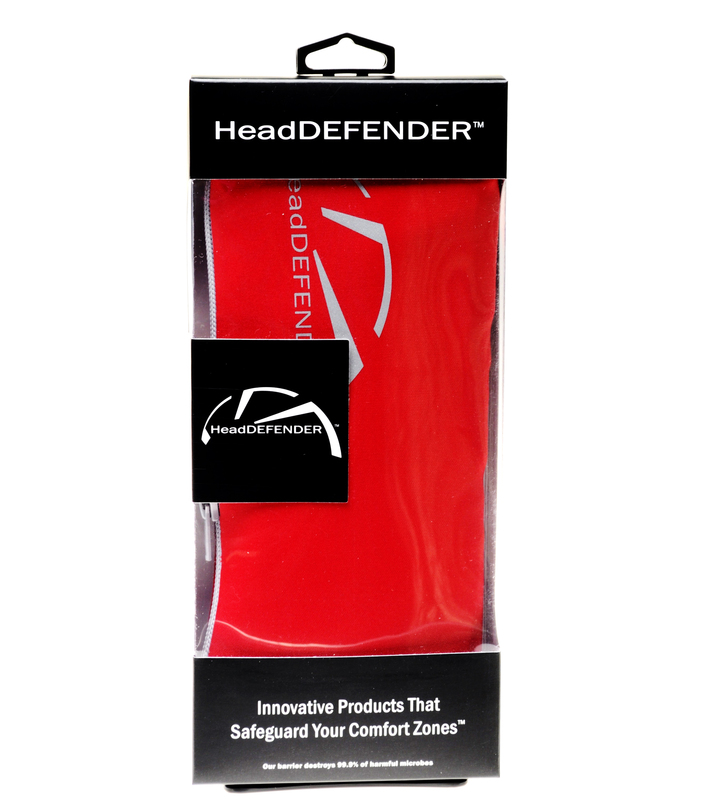 Why HeadDEFENDER Technology from Head Defender on Vimeo. 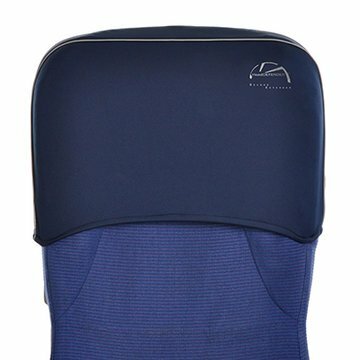 Why HeadDEFENDER is superior to airplane seat covers? With the HeadDEFENDER, you can protect yourself from germs without the inconvenience of using a full-size airplane seat cover. Your “germ danger zones” are your eyes, mouth, nose, and ears; in other words—your head. 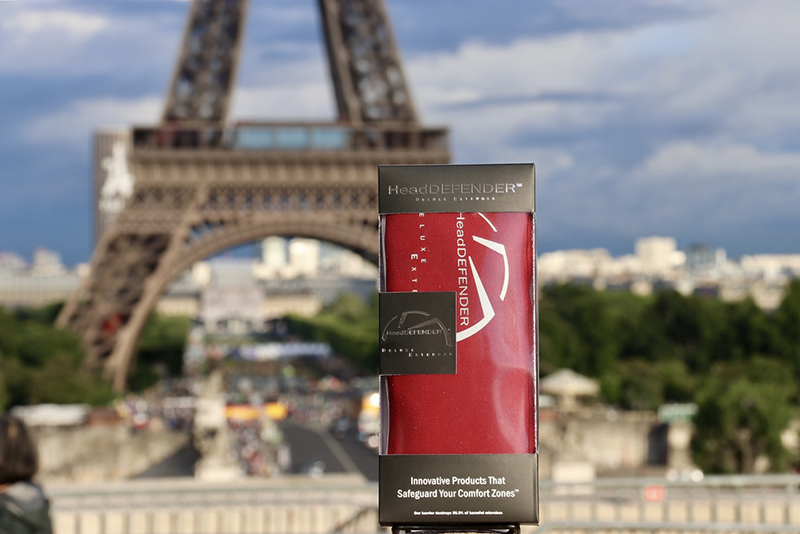 The HeadDEFENDER focuses on where you’re most vulnerable. Unlike big bulky airline seat covers, which can be time consuming and difficult to use, the HeadDEFENDER is compact, light, and only takes seconds to place on your airplane seat. So you can quickly protect yourself without inconveniencing other passengers. 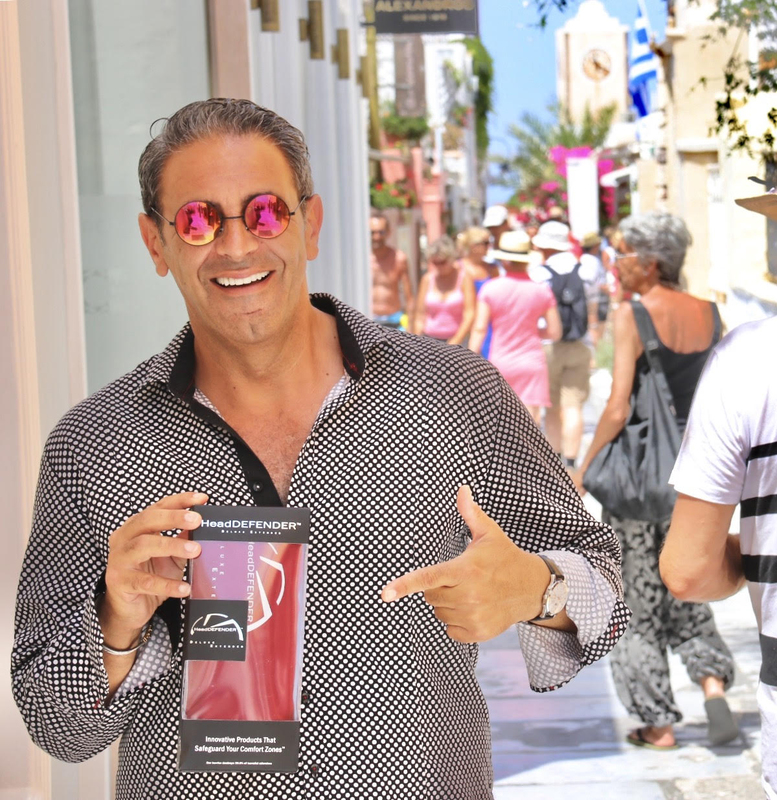 The best part is this powerful protection looks great and is so small it can fit in your pocket! The HeadDEFENDER Deluxe Padded™ Headrest Cover is a compact 2-in-1 travel accessory that transforms into a headrest cover and neck rest. 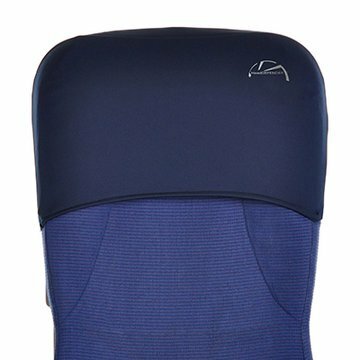 It’s ideal for travelers who travel by airplane and who want added neck comfort. This ultra-comfortable headrest cover has a window on the backside that will help prevent the obstruction of most types of media centers on the backs of airplane seats. The HeadDEFENDER Deluxe Padded™ is cross functional and can be used on most standard size seats for trains, buses and movie theaters. 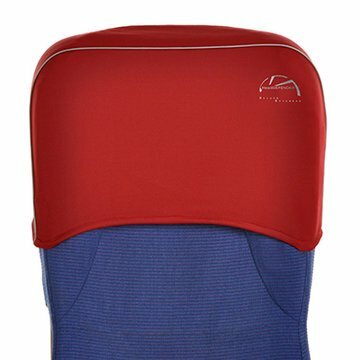 Multi-Use: This compact 2-in-1 travel accessory transforms into a headrestcover cover and neck rest for travelers. Neck Support: The microbeads offer the utmost in travel comfort and conform to your shape. Innovative Design: Will not cover most media center models or tray tables behind your seat. Single-Piece Construction: The “zip-up” pouch design eliminates the need for extra cases or pouches that are easy to lose. 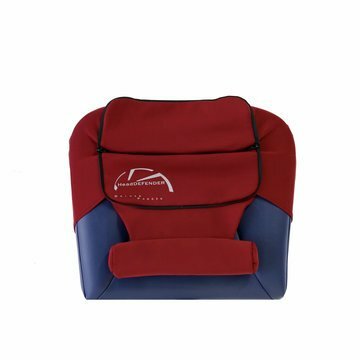 Cross Functional Can be used on most standard size seats for airplanes, trains, buses and movie theaters. 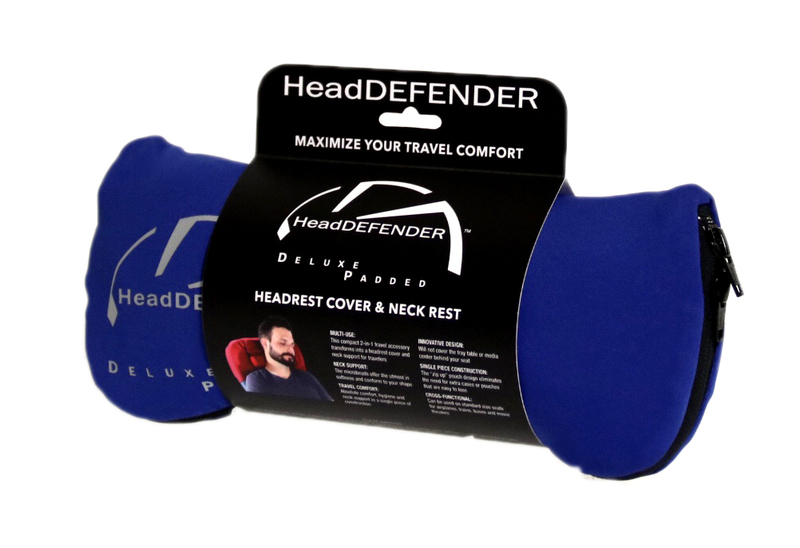 The HeadDEFENDER Standard™ Headrest Cover is ideal for travelers who travel by airplane and who already own a travel pillow. This headrest cover style has a window on the backside that will help prevent the obstruction of most types of media centers on the backs of airplane seats. 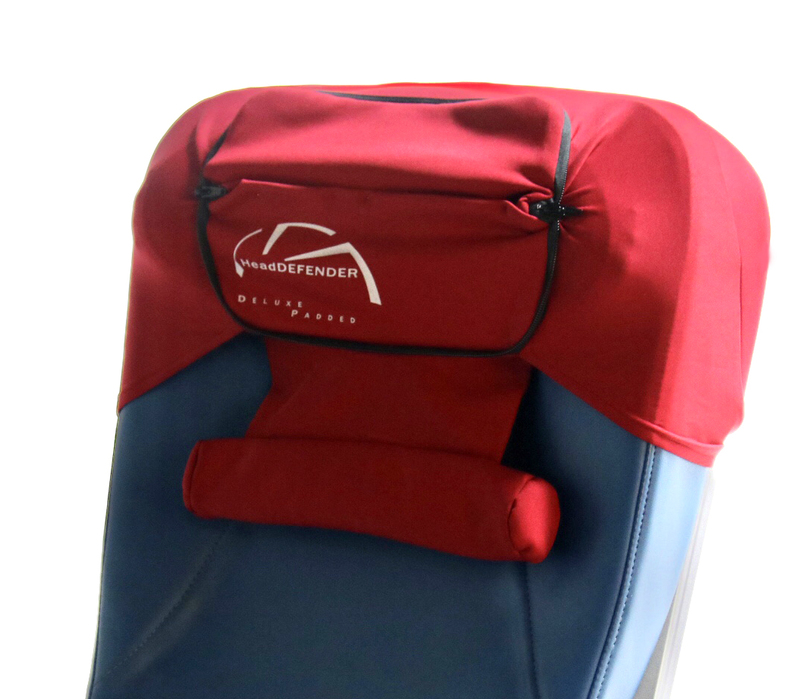 The HeadDEFENDER Standard™ can also be used on most standard size seats for trains, buses and movie theaters. 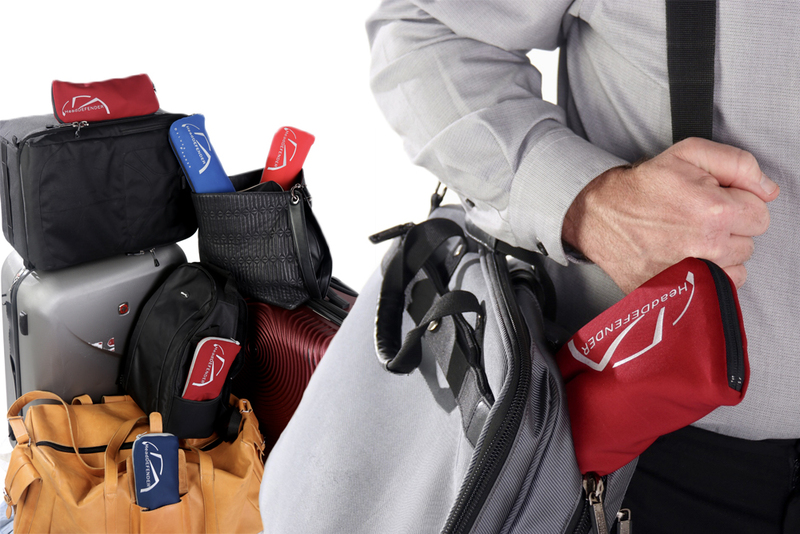 Single-Piece Construction: The“zip-up”pouch design eliminates the need for extra cases or pouches that are easy to lose. The original award-winning headrest cover that started it all. 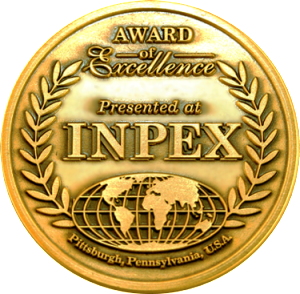 Ideal for travelers who travel mostly by train or bus. 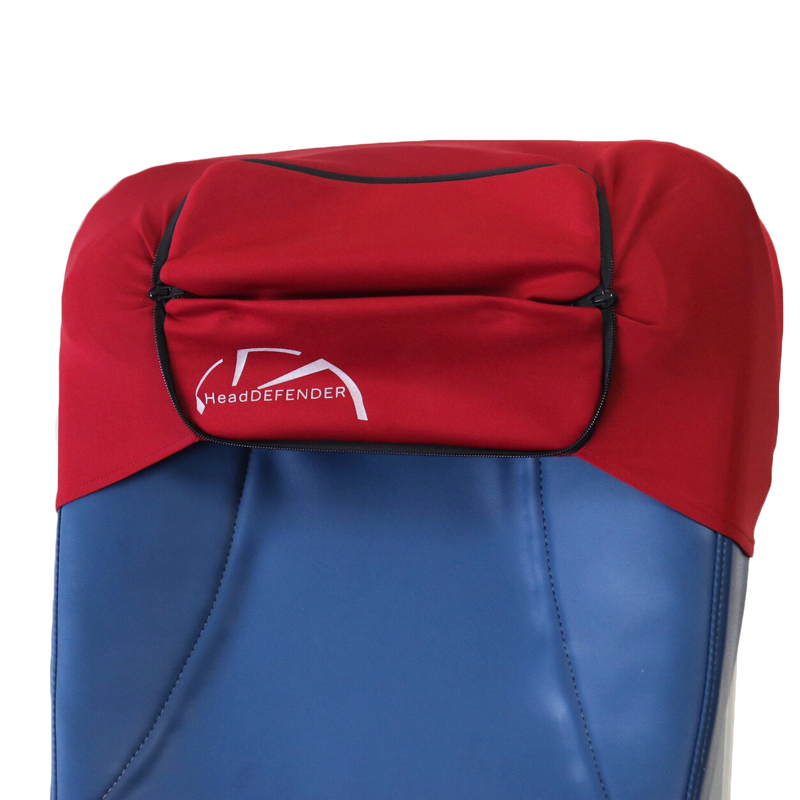 The HeadDEFENDER Original™ can be used on most standard size seats for trains, buses, movie theaters and some airplane seats without the media centers on the backside. The award winning HeadDEFENDER Deluxe Extended™ headrest cover has the same great quality as the HeadDEFENDER Original™. 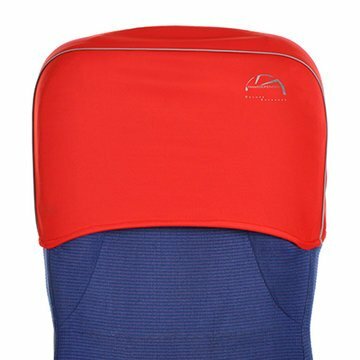 This headrest cover is ideal for travelers who travel mostly by train or bus. It extends an additional 4 inches on the frontside. The additional length helps to accommodate travelers who are shorter in height, have longer hair or who often sit in high-back seats. 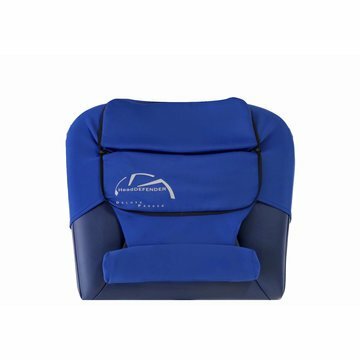 The HeadDEFENDER Deluxe Extended™ can be used on most standard size seats for trains, buses, movie theaters and some airplane seats without the media centers on the backside. Did you know some commercial airlines only clean their planes every 3-4 weeks! When you consider the fact that some bacteria can live up to a week in planes and the thousands of flyers per week in a given plane, this creates a disgusting breeding ground of potentially dangerous germs. Why just protect your head & face? Because your face, neck, and head are the most at-risk area on your body for germ exposure. 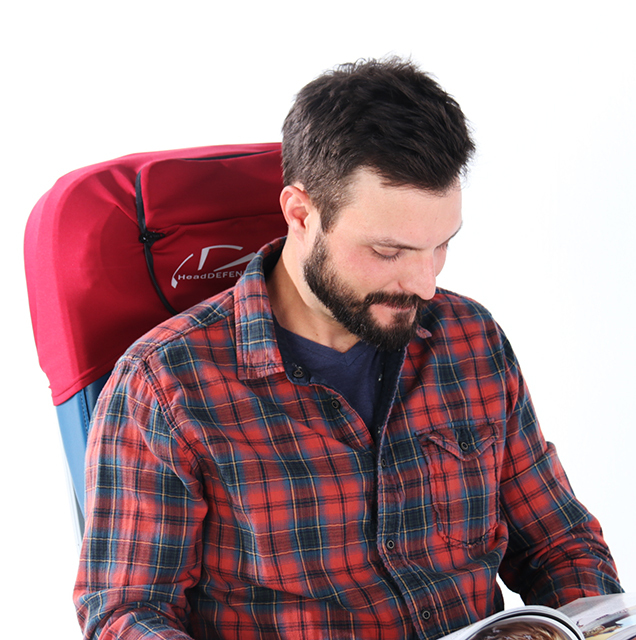 So there is no need for a bulky and inconvenient full seat cover. 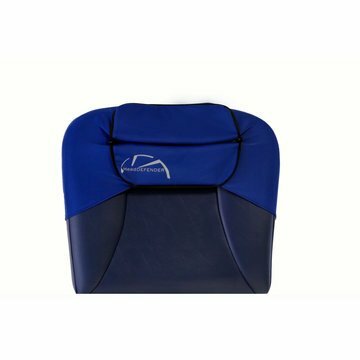 Simply use the HeadDEFENDER to slip over airplane headrests and then use sanitizer wipes to wipe down your armrests for protection against disease-causing microbes and germs.